UPDATE: Bird Week 2013/14 are all done. Please visit www.vancouverbirdweek.ca for Bird Week 2015 information. Did you know that Vancouver lies part way along the Pacific Flyway and is among the prime destinations for birds in Canada? In fall, winter and spring, the shores are used by thousands of waterfowl, shorebirds, and wading birds and in the summer, the breeding songbirds are diverse and plentiful. There are 276 species that occur annually and another 136 seen periodically in Greater Vancouver. One of the best times to see birds around Vancouver is in spring when the migrants begin to arrive and before the winter species depart. From May 4 through May 11, Vancouver will celebrate the arrival of spring birds through a series of events, including World Migratory Bird Day. The City of Vancouver is a leader in Canada when it comes to celebrating birds. 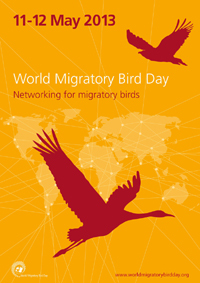 World Migratory Bird Day (WMBD) is a United Nations sponsored initiative that recognizes the importance of birds as key indicators of the health of our environment. In May 2011, Park Board Commissioners Constance Barnes and Loretta Woodcock for the first time read a proclamation signed by Mayor Gregor Robertson that recognized WMBD. 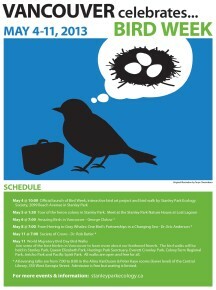 Last year the City, along with the Stanley Park Ecology Society, Bird Studies Canada, Nature Vancouver, the Vancouver Public Library, Tourism Vancouver and other partners, again recognized WMBD with a series of events and even more events are planned for 2013. Of the 13 WMBD events held across Canada last year, Vancouver was responsible for 7 of them. 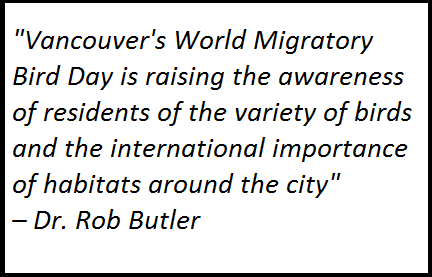 Vancouver is also joining International Migratory Bird Day this year. The City of Vancouver is also working with the partner groups to improve management of birds and their habitats through the creation of a Bird Agenda for Vancouver. This agenda will involve steps for improved management of birds and their habitats such as development guidelines, best management practices, and a public education strategy.